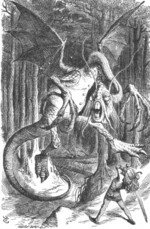 Lewis Carroll's poem 'Jabberwocky' is a perennial favourite and works with students of all ages. It appears in the novella Through the Looking Glass. Alice finds the poem in a book in the looking-glass house. At first she thinks it is in some language she does not know, but then realises it must be a looking-glass book, in which the writing is backwards. When she holds the book up to a mirror, Alice finds she can read the poem. 'Jabberwocky' is a great poem for teaching the role of intertextuality and decoding skills in comprehension.